I have been checking out the Base Magique Primer at the Loreal Counter near work for quite some time now. And because I kept coming back at the counter just to check and weigh down my options if this primer is really a good buy, I noticed this little sign. Hooray!! 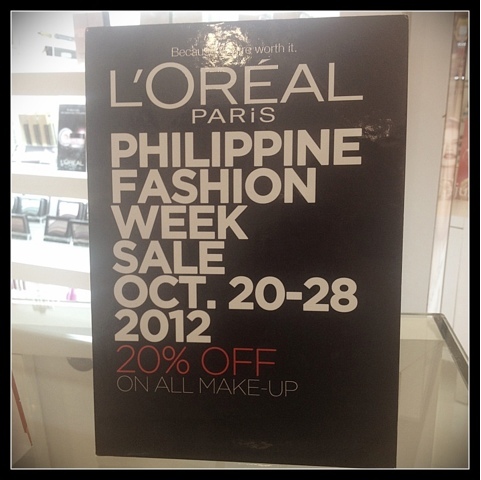 All make up from Loreal will be discounted from Oct 20 -28! We have until Sunday ladies! Is this a sign that I should purchase the base magique now? I am nearly running out on my ellana primer anyway. I found this at the Loreal counter at SM Department Store (Marikina). Go and check the ones near you! Please hit a comment if this has been helpful. I really appreciate it! :)) I'd love to know your purchases too! Thanks for this suggestion! I love it!